A delicious combination of fragrant Rose Petals and refreshing spices, Pitta Tea is the perfect answer when you're feeling intense or frustrated. Drunk warm or cool, it helps cool down your mind, body and emotions. Spice Wise Spices are ingredients in many synergistic ayurvedic herbal formulations, and an ayurvedic expert, when giving you advice, is as likely to recommend specific spices to include in your diet as to suggest herbal supplements for you to take. * Rose Petals are considered cooling in ayurveda, helping to pacify Pitta dosha. * Licorice contributes the sweet taste, useful for pacifying Pitta. * Cardamom is tridoshic (good for balancing all three doshas), but people trying to keep Pitta in balance should eat it in smaller amounts. Cardamom is considered an excellent digestive, especially beneficial in reducing bloating and intestinal gas. * Ginger is a zesty spice useful in aiding digestion, enhancing appetite and pacifying stomach disorders. * In ayurveda, cinnamon is used to balance the digestion and to pacify stomach disorders. Cooling (Pitta) Tea! 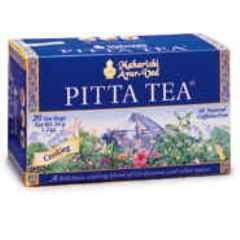 Pitta Tea Ingredients: Cardamom, Licorice, Ginger, Cinnamon, Dried Rose Petals. Our goal is to make every industry successful and fulfilling in a scientific and systematic way, which means it has to be Vedic. Realization of the Vedic quality in any industry will be through Vedic Education, Vedic Health Care, and Vedic Administration. All areas that constitute industry must be supported by Vedic Consciousness which alone is holistic consciousness, which is supported by the total creative potential of Nature Law - all the forty aspects of the Veda and Vedic Literature. Only the Vedic Consciousness of those in charge of industry can create a balanced industry, which will support all values of individual life and its relationship with family, community, country, and the world, and with its cosmic counterparts-the sun, the moon, the stars and the galaxies. This knowledge of Natural law, on the level of industry, will make industry truly Vedic. Now it is time for every industry in India, big or small, to celebrate the dawn of perfection-the Vedic quality of industry. A Sound Amalgamation of Vision & Wisdom The Maharishi Group is perhaps the only organization, which has offered the world a unique blend of time proven ancient wisdom and the corporate activities based on the vision of His Holiness Maharishi Mahesh Yogi. The central emphasis of the Maharishi Vision is on ridding the Society from sufferings, whether these are health related or otherwise, by re-enlivening the body's intelligence through connecting it to the bountiful and perpetual reservoir of Nature's Intelligence. Thanks to Maharishi Vedic Science, this ancient knowledge has found a perfect application in all the areas like health, education, society, environment, industry, management, agriculture, housing, and trade and commerce. The worldwide TM (Transcendental Meditation) movement started by Maharishi over 50 years ago has now more than 7 million meditators who are practicing the most simple and effective method of integration of life and enjoying its benefits. In India, Maharishi organization is engaged in multifarious activities including education, health, technology development and social welfare. Maharishi Group is a multinational and multidimensional conglomerate with presence in over 120 countries. To help our overseas visitors we have added a useful currency converter that allows you to see our prices displayed throughout the site in US Dollars, Euros and British Pounds.Simply select the relevant currency tab on the bar at the top of the page. However, we are unfortunately not able to complete financial transactions in these other currencies. You will be charged by us in Indian Rupees and your credit card company will perform a currency conversion into your native currency based on the bank rate of the day. © 2004-2017 India Abundance, All Rights Reserved.